It would have been a pretty fine Marc Jacobs fashion show by virtue of the clothes alone, but the designer who closes out New York Fashion Week every season had something else up his very voluminous sleeves. Wedged into his lineup of models Thursday evening was none other than Lady Gaga, unheralded and apparently little noticed as she put on the blankest of model expressions and strutted the runway in platform boots, a huge black coat with green-tinged fur sleeves, and a big bow at the neck in pastel green, with matching purse. 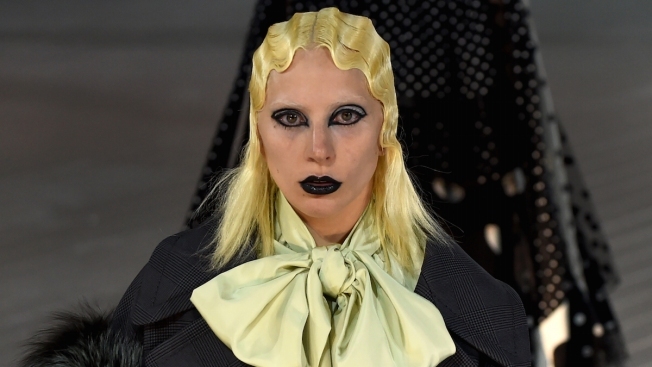 With heavy black makeup on her eyes and lips, and platinum blonde hair in finger waves, Gaga blended in exceedingly well. There was no applause or audible sign of recognition from the crowd in the cavernous Park Avenue Armory. As for the show itself, it had an austere, Victorian or Gothic feel — with no music on the soundtrack, just the sounds of bells pealing — and featured mostly long, grand coats and gowns in black or dark hues, with occasional pops of color. While some of the garments seemed perfect for, say, a stroll in a 19th-century London park, others had a more otherworldly feel, such as a huge, feathery concoction worn by model-of-the-moment Kendall Jenner. And the shiny, laced-up, very high platform boots added a comic-book feel to the proceedings. Jacobs, who rarely does much explaining of his shows, did include a note in his program referring to Keiji Haino, a Japanese musician who uses a concept of "ma," described as "the haunted spaces between the notes" — which may have explained the soundtrack. Also there: actresses Juliette Lewis, Christina Ricci, Sandra Bernhard and Debi Mazar, among others. "Is that her? The blonde?" Bernhard asked about Lady Gaga after the show. "OK, I honestly didn't know it. She is unrecognizable! She's a chameleon. But yeah, she looked great now that I know for sure it was her." Bernhard's verdict on the clothes: "Really great. It was romantic and out there and it was just inspiring."